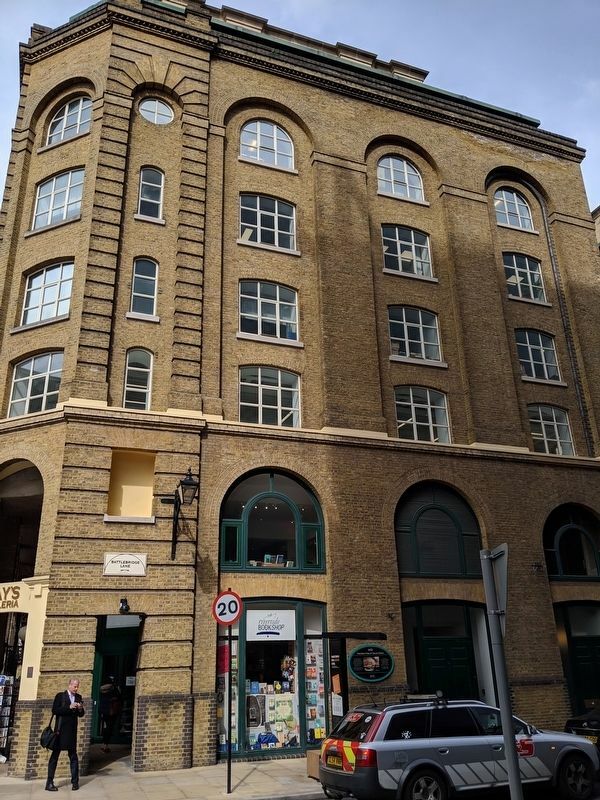 Hay's Wharf was one of the earliest quaysides to incorporate fireproofing, using incombustible floors of brick arches on cast iron beams. Despite this Hay's Wharf was destroyed in the fire of Tooley Street of 1861. This was London's biggest fire since the Great Fire in 1666 and one that claimed more lives. 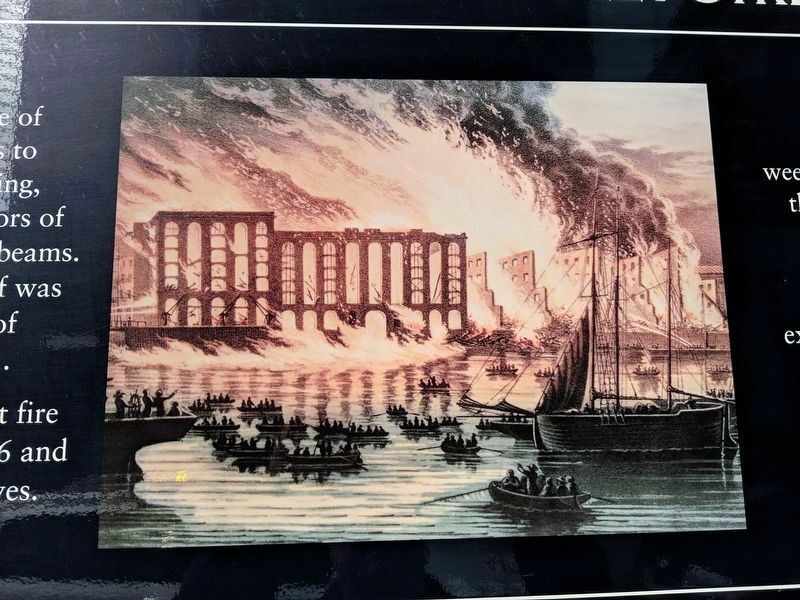 It raged for two weeks and James Braidwood, the superintendent of the London Fire Engine Establishment, perished when a warehouse exploded at Cotton's Wharf. As a result of this, the London Fire Brigade was founded in 1866. Erected by Hay's Galleria, London Bridge City. Location. 51° 30.303′ N, 0° 5.035′ W. Marker is in London Borough of Southwark, England, in Greater London County. Marker is at the intersection of Battle Bridge Lane and Tooley Street (England Route A200), on the right when traveling south on Battle Bridge Lane. Touch for map. Marker is in this post office area: London Borough of Southwark, England SE1 2QN, United Kingdom. Touch for directions. (about 210 meters away, measured in a direct line); The Glaziers Hall (approx. 0.4 kilometers away); William Nicholson (approx. 0.4 kilometers away); St. Saviour’s & St. Olaves Girls’ School (approx. 0.4 kilometers away); The George Inn (approx. 0.4 kilometers away); Southwark Cathedral (approx. 0.4 kilometers away); Wharfinger Cottage (approx. half a kilometer away). Touch for a list and map of all markers in London Borough of Southwark. More. 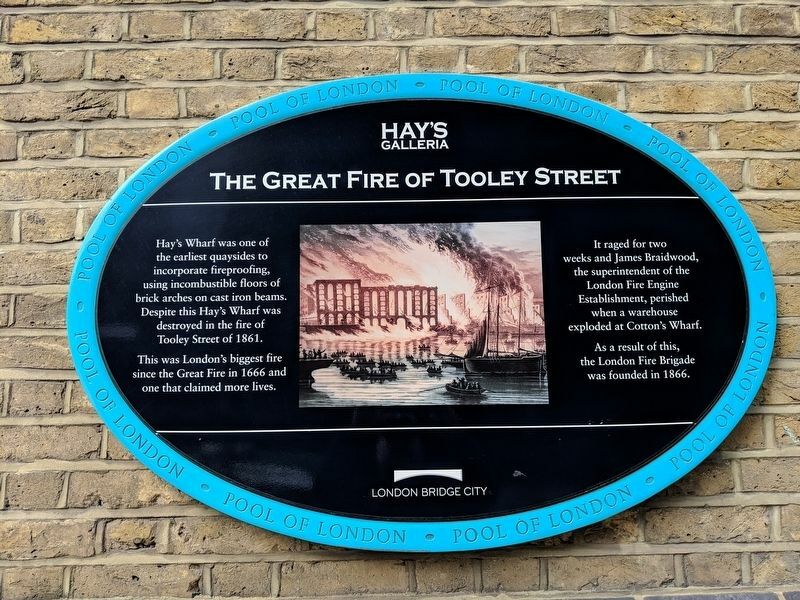 Search the internet for The Great Fire of Tooley Street. Credits. This page was last revised on April 13, 2019. This page originally submitted on April 11, 2019, by Mike Wintermantel of Pittsburgh, Pennsylvania. This page has been viewed 43 times since then. Photos: 1, 2, 3. submitted on April 11, 2019, by Mike Wintermantel of Pittsburgh, Pennsylvania.